And some things that should not have been forgotten were lost….. Yes people. somethings should not be forgotten. Many things perhaps. Maybe some things that were never learned. But I digress. How was your Thanksgiving! I hope it all went well, you know, the family get together. It’s always a bit of a mixed bag isn’t it? Hmmmm. Keep it secret….keep it safe as Gandalf said long long ago. 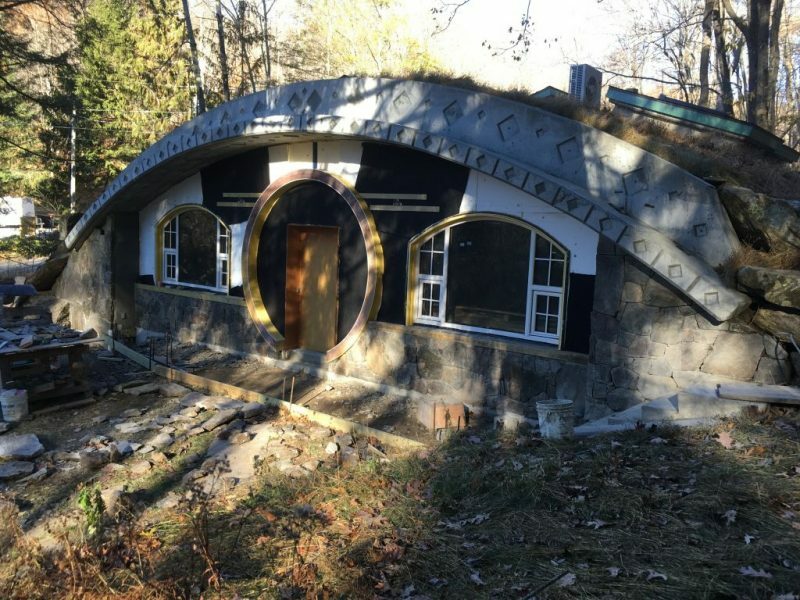 Welcome again to the never ending saga of Hobbit Hollow. I really do hope you enjoyed your Turkey Day. For those of you who are outside of the United States it really is a great tradition. Being thankful and celebrating what you have in one way shape or form. No gifts either. That’s kind of the best part. Keep it simple. Just bring that bowl of succotash. Ah succotash. I miss it. Haven’t had it in a dogs age either. Gotta look up a recipe for it one of these days. It’s funny what you think of when you’re writing a blog about construction. So many things pop into your head. Like succotash. To be honest I really don’t know where to begin. Needless to say I didn’t get the chance to work on the house this weekend. Had to work the Friday after Thanksgiving as usual so that is always a bummer. What are you going to do. Had my old friend Mike pay me a visit over at the house on Saturday. I gave him the grand tour. It was great seeing him. It was really nice taking a break from everything and just spend a few hours talking about old times…..and new. He heads down to sunny Florida now for winter. You lucky dog you. That was a really nice afternoon. Thanks for taking the time to stop by. We’ll have to do that again when you and Diane are back in Jersey later next year. Enjoy your time down south Mike. You deserve it. For the record the stone guy is working away. He’s just about done with the front of the house. Heading towards the back Monday. The weather is in our favor this week so hopefully we will get it all done before the cold weather sets in. That would be fantastic. I have to design a fireplace for the guy and get him to give me a price. It’s not going to be a real working fireplace because this is a Passive House. Totally air sealed. Can’t have any drafts. I’m going to put those fake electric logs in there. The ones I’ve seen look pretty good. I was thinking of doing a stone fireplace with a huge piece of rough sawn lumber on top for the mantle. I have a neighbor who has his own saw mill. Might be able to get him to cut me something really heavy looking. The only problem I see is I need the fireplace to have a significant arch. This would probably have to be made out of steel. Especially since we’re talking stone on top of this. It’s going to be the focus on this end of the room so it’s going to have to be done right. Gotta put a couple of sketches together and try and figure this one out. Not really a very good picture because there’s too much shadow. I’ll try for a better shot next weekend. So yeah I go get the Sunday morning donuts every week. I usually try to get one per person and add an extra for diversification purposes. I always seem to blamed for a lack of choice. The main problem is nobody winds up eating these things so I always seem to be left with the task of finishing off the balance. That’s why the one donut per person rule is critical. Any more and my waistband would be a ring of jelly donuts. I’m not kidding. (It’s also why I’m such a huge fan of stretchy pants.) So usually I arrange the donuts on a plate with a knife. This way if you want to try more than one it’s sanitary. You know what I mean. 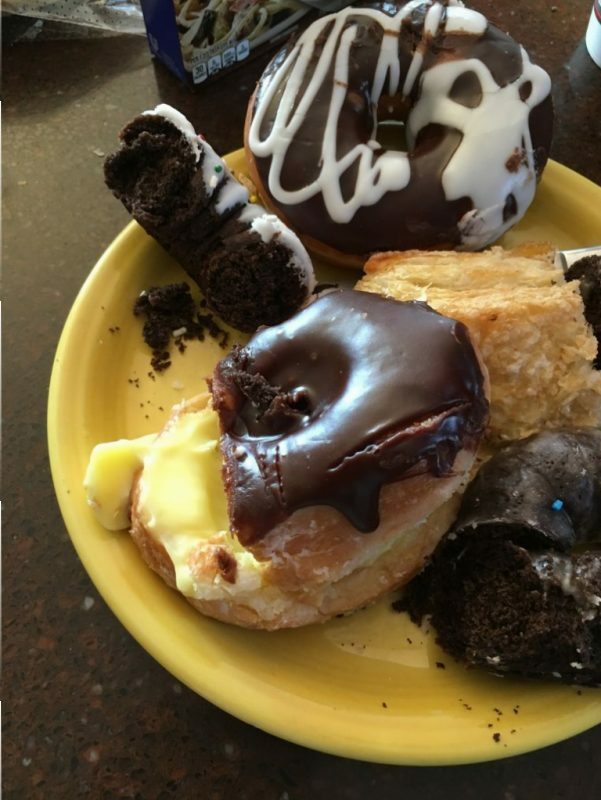 You can’t maintain your appetite if someone takes a chunk out of a donut and just leaves it there. It’s unsightly. Hence the knife. Check out what twiddle dum does. Poorly cut crough dough custard donut with chocolate frosting. I mean really? Who on God’s green earth would ever cut a donut like that. This is what I have to deal with people. How do you even pick up the piece that you cut and cram it in your mouth. But whoever did this didn’t even leave a legit piece of the donut intact. As far as I’m concerned this donut has been destroyed. It’s useless to me. We’re definitely going to have to start enforcing the donut laws we have on the books. If you do the crime you’re going to have to do the time. Jude. Oh yeah. Took a picture of that faucet I replaced in my powder room for the special people who were coming over for Thanksgiving. It was a lot smaller than I said it was. The door opening was only nine and a quarter inches across. (I didn’t tell you this last week but once I squeezed myself in through the door I couldn’t get out. The Editor and Terence each had to pull on one of my legs to pop me out of the vanity.) Check out the size of this thing. 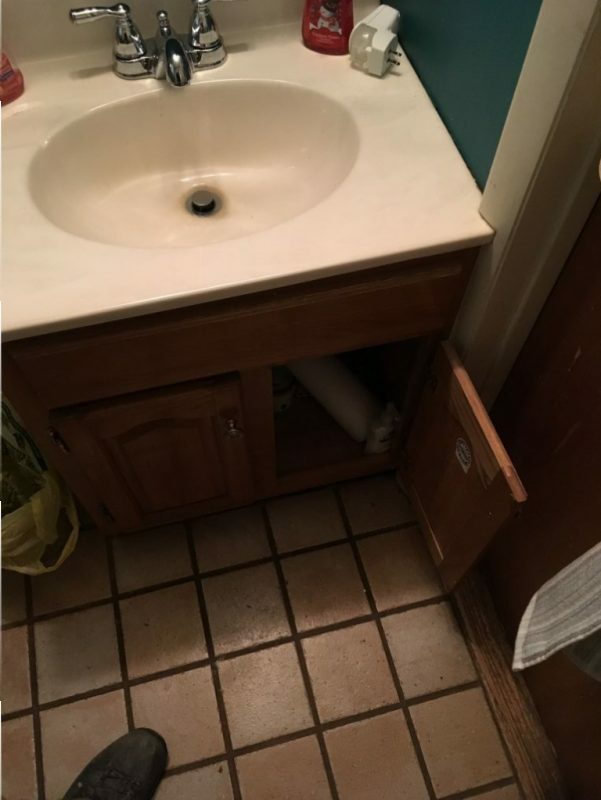 200 pound man gets stuck in vanity with basin wrench. When I look at it now it’s amazing that I was even able to get in there. I might be able to get some side work as a contortionist. Hmmm. I wonder if the Big Apple Circus is hiring. Maybe I can pay for that fireplace with a little side work. (In the center ring watch as overstuffed man gets inside and out of vanity with basin wrench clenched between his teeth!!!!!!!!!!!) Gotta love the big top. Well I’m glad you are all hanging in there. enjoy the upcoming holiday season and have a good week! PS: Just finished watching the Carolina Panthers beat the Jets in a game the Jets should have won easily. Another horrible Jets loss. My point is we went over to my sister-in-laws house to watch the game. She serves us pigs in a blanket. I happen to really love pigs in a blanket……..but she didn’t have any mustard. How can I eat pigs in a blanket without mustard?????? One more picture for the road. 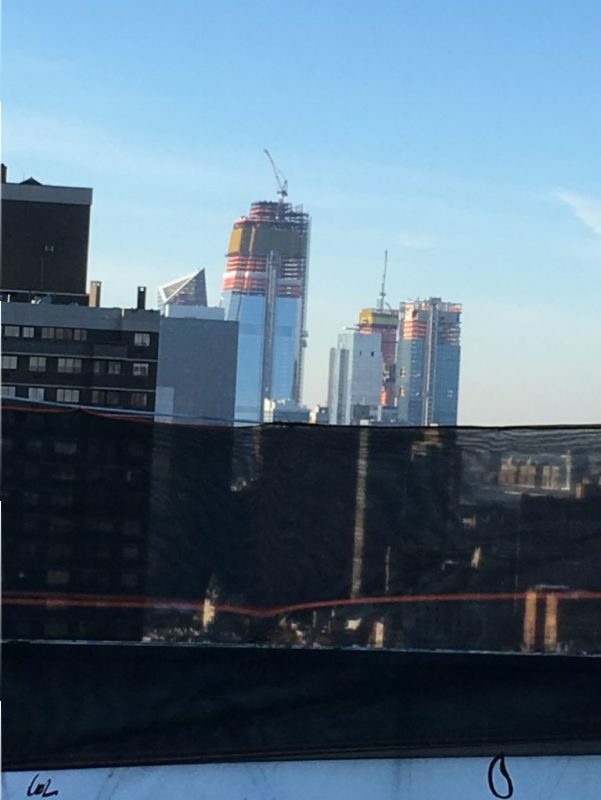 the morning view of Hudson Yards from 61st street. The company I work for did two of the five jobs down there. Sorry I’m replying at such a late date John. Yeah, that faucet was a challenge. Sylvester and Tweety…how can you forget. Although I wasn’t thinking of them when I wrote that the other day. Had a great Thanks ,the food was the best,it is great getting together with family. As far as the Jets game it made you to sick to eat,but you did a good job,even with out mustard,you really went into those nachos,you better hang onto those stretchy pants your really going to need them with Birthdays and christmas eve and day coming,but you will hang in there you always do, I must say it is a pleasure to watch this family eat a good meal. Thank God I know how to cook a good meal!